If you are looking to buy an iPad from a trustworthy authorized Apple reseller (as opposed to random eBay refurbisher du jour), B&H Photo is having iPad Instant Savings promotion featuring iPads of all sizes, from the 8″ Mini all the way to the 13″ PRO. NOTE that prices may differ slightly between different body colors for both the Wifi-only and the 4G LTE models. With the Super Bowl just around the corner, many retailers are focusing on big TVs, especially now that 4K / UltraHD has broken through, unlike the various attempts at 3D in previous years. But Adorama has not forgotten the computer monitors, they have an LG Computer Monitors sale featuring screen sizes from 24″ to 43″ and prices ranging from $247 to $1300. Some are 16:9, while others are 21:9. Speaking of Winter sales, Adorama is also running a Winter Apple sale featuring a variety of Macbooks (PRO and AIR), iMac Retinas, iPads, and more. They also have the new Apple iMac Pro 27″ with 5K Retina Display in-stock. For audiophiles, Adorama has a sale on the HiFiMan HE560 Premium Planar Magnetic Headphones for $350 with free shipping. B&H Photo is an authorized Apple reseller, and they are back with another MacBook PRO sale featuring twenty laptop models, with prices ranging from $1199 to $3299, with free expedited shipping. The sale ends 1/31/18 or earlier if any sell out. Authorized Apple dealer B&H Photo now has in-stock 7 options of the new 27-inch iMac PROs, with prices ranging from $5599 to $8799. Free expedited shipping for these. B&H is an authorized Apple dealer. The year is almost over, and the year end sales of Apple products are in currently in-progress at Adorama and B&H Photo, both authorized Apple dealers. A wide variety of Apple products are participating in a big Apple Sale at B&H Photo including Macbooks, iMacs, iPads, Mac Minis and even a “cylindrical”. You can do the “Load More” to see them all, or filter them by product category using the options there. Can’t wait for CES 2018 for new products? Apple has you covered! A brand new series of pro tier 27-inch iMac PRO Retina 5K is coming out soon and they are available for pre-ordering at B&H Photo. There are 41 options (yes, forty one) with prices ranging from $4999 to $13,199! Too many to list here individually, check the aforelinked B&H pages for details! MacMall too is participating in the Green Monday festivities with a Green Deals of the Week sale featuring half a dozen different MacBooks. They also have a Best Sellers sale featuring a mix of Apple and PC/Tech sales, living in harmony, side by side on their piano website! For non-Apple-centric shoppers, they have their PC Mall Green Monday sale as well with various weekly offers. Some of the Apple sales expired with the calendar end of Cyber Monday, but not all of them! A number of Apple Sales continue at B&H Photo. Some of them have a Saturday night expiration, while others are in-progress without a built-in expiration time. AS usual, it’s a mix of MacBooks, iPads, iMacs, and Beats. And now time for some lens filters! Adorama is offering the new condition Cokin P Series H300-01 Solid Neutral Density Filter Kit (includes ND2, ND4 and ND8 Filter, model CH300-01) for $33 with free shipping and handling for a limited time. While there, they are offering the new condition Apple 15.4″ MacBook Pro with Touch Bar (2.9 GHz i7, 16GB RAM, 256GB SSD, Radeon Pro 460 GPU 4GB GDDR5, Late 2016 model) for $1899 with free expedited shipping. For more action, check the latest B&H featured sales. Adorama has launched a limited time Apple 2-Day Sales Event featuring a trio of iMacs (Retina 5K), a trio of Apple MacBookPROs with Touch Bar, a quartet of iPad PROs (two of each screen size), along with the Apple Magic Keyboard, Magic Mouse 2, and Magic Apple TV 4K 🙂 A total of fourteen products are participating in this limited time sale! One of the main Gold Box deals of the day at Amazon is a sale of half a dozen certified refurbished Apple MacBooks with prices ranging from $800 to $1400. These are sold by Woot with the orders fulfilled by Amazon (Prime eligible) and come with a 90 day warranty. Sale ends on Monday at 3am ET or earlier if any of them sell out. Speaking of the Gold Box, another offer buzzing in there is a combo meal, Fire TV Stick with Voice Remote + Echo DOT, together for $70. Limit one per customer as a discounted combo. This offer is NOW LIVE! B&H Photo has three MacBook PRO laptops on sale with free shipping. It started on Wednesday at 12:01am ET. If you are tempted by the 2017 9.7-inch iPad, Adorama has a doorbuster sale on the 9.7-inch 32GB iPad (2017 model) on the Space Gray color scheme for $279 with free expedited shipping. Limit two units at the sale price. The other colors go for their regular price of $329. This is the Wifi-only model. This is model MP2F2LL/A. If you are interested in getting a MacBook, you are in luck, B&H Photo is currently running a MacBook Sale featuring 102 different options. Prices ranges from $899 to $3999. No coupons needed. For more action, check their OPTIC 2017 sales (ending soon) and their latest Featured Sales..
For Apple fans, Adorama is offering the Apple MacBook Pro 15″ with Touch Bar (model Z0SH-MLH4230 Z) with Intel i7 2.9GHz 16GB RAM, 1TB Flash Store, 2880 x 1800 resolution, and 3 Year AppleCare included for $3499 with free expedited shipping. This is a limited time offer. For more Adorama action, check their One Day Sale. This lightning deal expired… Good until 10::09pm ET, the AppleCare Protection Plan for Mac Laptops 15 Inches and Above (NEWEST VERSION) is on sale for $209~ with free shipping by Amazon itself. The price before the sale was $299 last night when I posted the Lightning Deals schedule. B&H Photo also has a limited time Apple-themed sale. The 9.7″ iPad PRO (32GB, Wifi + 4G LTE) goes for $599, while /BI/1515/KBID/2055/SID/cpd111516appl’>three MacBooks of three different screen sizes are on sale $1200 to $2300. If you are a fan of Mac PROs (the cylindrical desktops) and iMac (all in ones), Adorama has a while-supplies-last type of a Closeout Sale featuring models from 2015, 2014 and 2013, with prices ranging from $400 to $1700. As of the time of writing, there are 21 cylindrical Mac PROs, and 41 iMacs. Speaking of Adorama, they refreshed their general clearance page, now with 3170+ items featured. You can filter it using the various options on the left hand side over there, and adjust the volume and style of information presented using the bar in the main content column over there. In today’s live-streamed announcement, Apple finally revealed their new generation of MacBook Pro laptops, with their brand new “Touch Bar” technology. They are available in 13.3″ and 15.4″ sizes, with prices ranging from $1500 to $2800 and they are available for pre-orders at B&H Photo and MacMall and other authorized Apple dealers. PS: I forgot about this event, so I wasn’t able to live-tweet it. If you are a Mac fan, B&H Photo has a special sale on the Apple 12″ MacBook (Early 2015, Space Gray) (1.3 GHz Intel Core M (Broadwell), 8GB RAM, 256GB PCIe, HD5300 Graphics, 2304 x 1440 IPS, USB-C, 802.11ac Wi-Fi, etc) bundled with Parallels Desktop 11 for Mac (OEM) for $999 with free expedited shipping. If you are a fan of the it-came-from-space MacPros, B&H Photo has a limited time offer on the refurbished Apple Mac Pro Desktop Computer (FE253LL/A) for $2199 with free shipping. This is 3.7 GHz Intel Xeon E5 Quad-Core, with 12GB RAM, 256GB PCIe-based Flash Storage, Dual AMD FirePro D300 GPUs (2 x 2GB), etc. This is a late 2013 model and comes with a 1-year warranty. 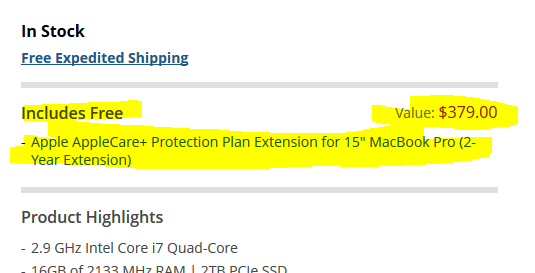 It is eligible for AppleCare which costs extra. For the Apple fans, the 13.3″ Apple MacBook Pro MF840LL/A laptop (8GB RAM, 256GB SSD, 2.7 GHz dual-core Intel Core i5 processor (Turbo Boost up to 3.1 GHz), 13.3 inchIPS Retina Display, 2560-by-1600 resolution, Intel Graphics 6100) is on sale for $120 with free shipping at Amazon by Amazon itself. This is “temporarily out of stock” but you can order it if you want to lock up this price. NAB 2016 brought a number of new products, and many of the new items are available for pre-order at B&H including the new 12-inch Macbooks along with a variety of 40+ other video-related products from GoPro, DJI, Canon, JVC, Blackmagic, Lectrosonics, Aja, Zacuto, Pelican, Zoom and more. The 512GB Samsung 850 PRO 2.5-Inch SATA III Internal SSD (model MZ-7KE512BW) is currently on sale for $212~ with free shipping, with a limit of three per customer, at Amazon by Amazon itself. Speaking of computer-related matters, Adorama has a closeout Apple sale with 135 items participating in the sale including some space-age cylindrical Mac Pros.